Green Infrastructure: Systems that mimic natural processes in order to infiltrate, evaporate, and/or reuse stormwater. Green infrastructure uses soils, topography, and vegetation in a way that minimizes the impacts of anthropogenic disturbance and maintains the pre-development hydrology and water quality of urban environments. The purpose of the Green Infrastructure Initiative is to support the emergence of green infrastructure throughout Central New York by equipping various audiences with the knowledge and skills necessary for green infrastructure design, implementation, monitoring, and maintenance; and by providing education on local funding opportunities and barriers to acceptance of green infrastructure. ESF professors and students have completed various on-campus projects, supported off-campus projects throughout Syracuse and Central New York, and designed courses to provide green infrastructure education for students. As part of a US Forest Service grant, ESF Outreach and its partners have developed a green infrastructure workforce development program (Green Train Landscaping and Urban Ecology- GLUE) for underemployed residents of Syracuse. This program addresses two critical concerns of the City of Syracuse – poverty and sustainable development – by simultaneously training a local underemployed workforce and enhancing the urban landscape with environmentally conscious renovation. The program emphasizes the use of green infrastructure to address water quality issues caused by stormwater runoff in the Onondaga Lake Watershed. The college also hosts the Green Infrastructure Symposium, where experts and specialists in green infrastructure share their insights into the growth of green infrastructure and discuss current opportunities and barriers in the field. This symposium serves as a gathering place for leaders, professionals, researchers, government officials, students, and others who are interested in green infrastructure and "green collar" workforce development. 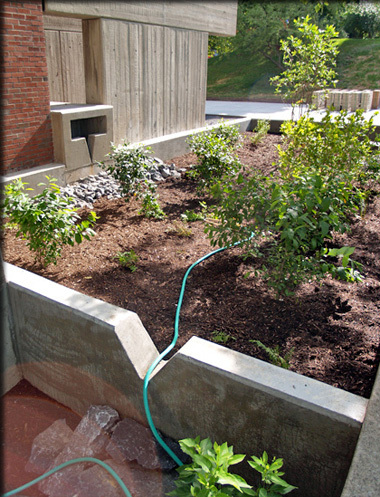 Rain garden (bioretention basin) at east end of Illick Hall. Holds stormwater runoff from the roof of Illick Hall in order to allow water to infiltrate into the ground and evaporate into the atmosphere. Porous pavement outside of Moon Library and Illick Hall. The walkway leading to the library entrance is constructed of Flexi-pave, a material composed of recycled tires and stone that allows water to percolate into the ground rather than running off into stormwater sewers. Heating cables beneath the Flexi-Pave melt snow during the winter months, preventing the formation of ice and eliminating the need for salt. 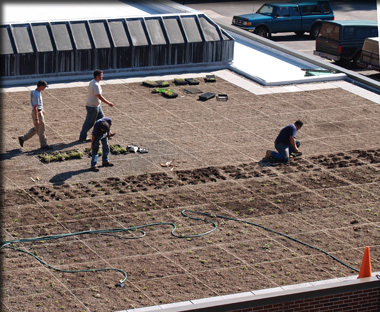 Green Roof on Walters Hall. Helps regulate temperatures in the building; reduces runoff from the roof; removes pollutants from the air; and promotes biodiversity by creating suitable habitat. Rain garden, porous pavement, and cisterns Incorporated into new road and parking lot construction to minimize storm water runoff. Stormwater storage tanks in Baker Laboratory. Four, 1,000-gallon tanks located in the building's basement collect rainwater from its roof. The water is then used in the building's cooling towers. This project is funded in part by the US Forest Service.